James Costlow (1822-1904) is my 3rd great grandfather. Here he is (far right) with his three brothers. 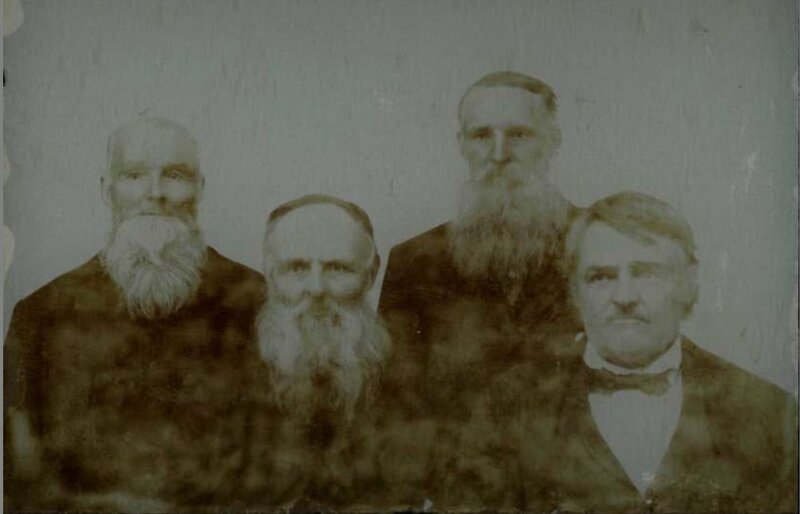 Left to right the brothers are: John Costlow (1823-1905), David Costlow (1828-1916), Henry Costlow (1835-1908), and James. My records indicate that these four also had two sisters, Rachel and Susan. James was the maternal grandfather of my great grandmother, Ida Rhoads Sears (1900-2002). Here is a pedigree chart showing Ida's relation to James. James is one of the more prominent figures in my family tree. In fact, he was included as one of the 500 sketches of "Prominent and Representative Citizens of the County" in the Biographical and Portrait Cyclopedia of Cambria County, Pennsylvania. It was first written in 1896. I have a copy of the 1980 reprint in The Psychogenealogist Library. This book is also available in a free fully searchable and indexed digital format. 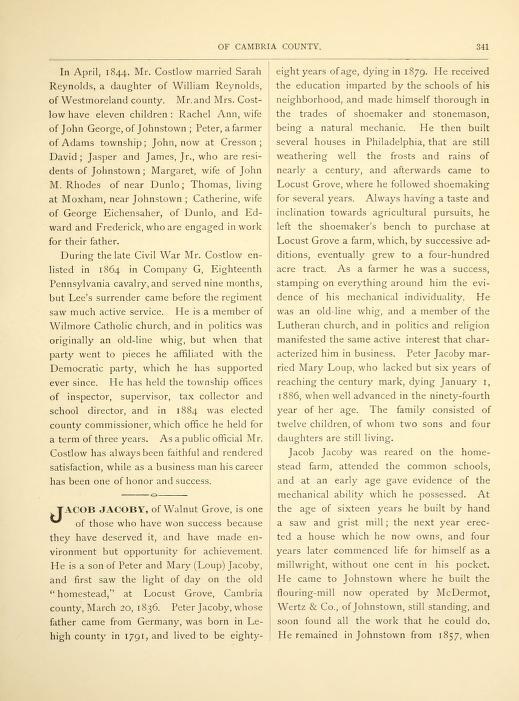 Here are the two pages that include the biographical sketch of James Costlow. He served as a county commissioner of Cambria County. His paternal great grandfather was, "one of the brave little band that came with the noble Lafayette to America." His grandfather (also a James) was born around 1775 in Pennsylvania. His father, Henry Costlow (1801-1850) was, "an old-line whig, held various township offices, and enjoyed the good-will and respect of his neighbors." James came with his father to Adams township in Cambria Count around 1835. He eventually moved to Dunlo and purchased a farm which he then sold in 1893. James and his first wife (my 3rd great grandmother), Sarah Reynolds (1824-1865) had about 11 children, one of whom was my 2nd great grandmother, Mary Margaret Costlow (1858-1947). My records indicate that James remarried after Sarah died (to an Elizabeth Seese, 1834-1921) and had three more children. James enlisted in the Company G of the Eighteenth Pennsylvania Cavalry late in the Civil War. The War ended nine months after James enlisted and he saw little action. Like his father, James was a Catholic and a member of Wilmore Catholic Church. The photo of the Costlow brothers above comes with some solid documentation from a distant cousin. I am quite confident that it is accurate. I have not been able to confirm a photograph of James in my own family collection. The place it would be, if anywhere, would be the cherished photo album of my great grandmother, Ida Rhoads Sears (1900-2002). Is this James Cosltow and possibly Sarah Reynolds? This is a tintype photograph (the image is on a stiff metal plate). It is quite small, only 2-3 inches in length. It is likely the oldest photo in the entire collection. This certainly seems to be a different couple than the previous. It appears very old, but unlike the previous it does not appear to be a tintype. Here is a side by side comparison of the the positively identified James Costlow (as an older man) on the right and the younger man on the left, from the first unidentified photo in my great grandmother's photo album (shared above). What do you think? Are they the same? My guess is yes. Check out others' opinions when this question was put to The Psychogenealogist Facebook page. Is the man on the left a younger version of the man on the right, James Costlow? What was in my great grandmother's photo album was this funeral card for James who died on July 8, 1904. Here is a brief mention of James's death in the Altoona Mirror. As a prominent citizen from a prolific family there are many other mentions of James scattered throughout news clippings during his lifetime and after. Several of his grandchildren were born after his death and the number of great, and great great (etc.) grandchildren now far surpasses the 100 or so mentioned in the news article above. It was nice to get to know this "Prominent and Representative" citizen of Cambria County, PA, my 3rd great grandfather, James Cosltow. This is the 24th of 52 weekly posts planned for 2018. It was inspired by the #52Ancestors writing challenge issued by professional genealogist, Amy Crow Johnson. The challenge: once a week, for all 52 weeks of the year, write about a relative in your family tree.